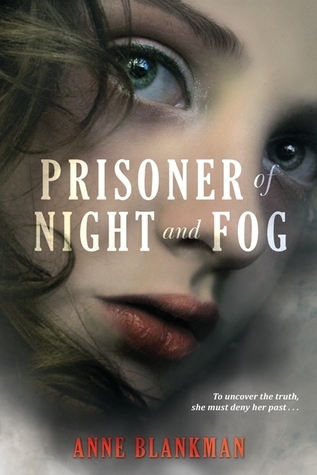 Prisoner of Night and Fog by debut author Anne Blankman is the first book of her historical fiction series of the same name. In 1930s Munich danger lurks behind dark corners, and secrets are buried deep withing the city. But Gretchen Muller, who grew up in the National Socialist Party under the wing of her "uncle" Dolf, has been shielded from that side of society even since her father traded his life for Dolf's, and Gretchen is his favorite, his pet. Uncle Dolf is non other than Adolf Hitler. And Gretchen follows his every command. Until she meets a fearless and handsome young Jewish reporter named Daniel Cohen. Gretchen should despise Daniel, yet she can't stop herself from listening to his story: that her father the adored Nazi martyr was actually murdered by an unknown comrade. She also can't help the fierce attraction brewing between them, despite everything she's been taught to believe about Jews. As Gretchen investigates the very people she's always considered friends, she must decide where her loyalties lie. Will she choose the safety of her former life as a Nazi darling, or will she dare to dig up the truth- even if it could get her and Daniel killed? 1. Blankman takes on a tremendous task of writing a historical fiction set during the rise of the Nazi party, and does an excellent job of it. She does an amazing job of capturing the mood in Munich during this time, both the fear in the Jewish community, and optimism of the Nazi, and tensions between the the Nazis and the Communist. 2. Gretchen is a smart and kind character. She shows kindness to a Jew at the beginning, which goes against everything she has been taught. She finds the courage to question everything she has been taught in a time when questions had fatal consequences. She has been the darling girl of the Nazi party, but she does not lose her humanity, and she learns to see past their teachings and fall for the "enemy." 3. Daniel is an extremely courageous character. He is a young Jewish man, and even knowing the risk of opposing the Nazi party, he continues to report the truth because he believes in doing what is right. He takes a big risk when he see something more in Gretchen and confides in her despite her status in the Nazi party. 4. For me, Reinhard, Gretchen's brother was a terrifying character. It is clear from the beginning that there is off about him. He is cruel and enjoys tormenting others. It is scary knowing the kind of people the Nazis attracted to their cause.